One year and six months ago, AntBase.de has started its work and since that time we had about 40,000 visits of people who were interested in the fascinating biodiversity of ants. Now we have about 5,000 visits every month! We have started with the presentation of photos of the "Ants of Borneo", and Malaysia will continue to be our focus area. In the future, however, we will deal with a larger area and include the ants of Peninsula Malaysia and Singapore in our virtual museum as well. In November 2005 the members of the ANeT will meet in Kuala Lumpur. This is a good reason for us to expand our focus even more and to encourage ant researchers from all over South East Asia to share their results with our readers. A first step towards a larger scope is already made with our “Villa” library that includes papers (PDFs) on ant research all over Asia. As AntBase.de is based in Germany we integrated a section on the "Ants of Germany", too. 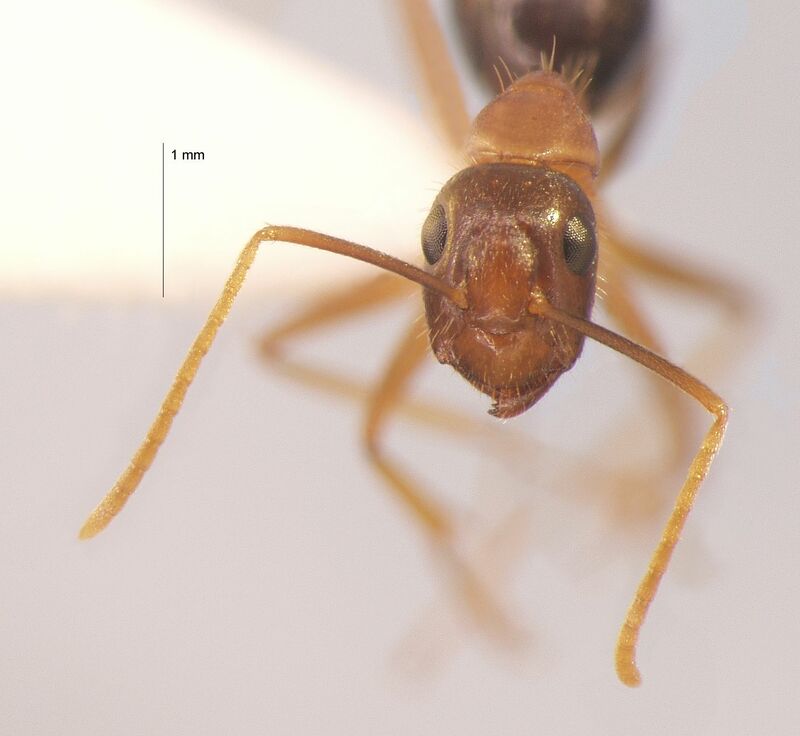 Together with Bernhard Seifert, a famous German ant researcher, we will increase this photo collection in future, including both images of specimens and pictures from ants in their natural habitat. Additionally, the “Ants of Mongolia” section will be introduced in June, so we are back to Asia again. We have already photographed dozens of species and we are eagerly working on a species list for this country. As you may have already noticed, we have started with automontage images. This method is about to become the standard in the photography of insect specimens, producing perfectly focused high resolution images regardless of the depth of focus of the optics, a brilliant idea and an innovative approach! And we have started with the presentation of large-sized photographs – probably we have the most detailed ant photos all over the web now. However, at the moment our photographic equipment is not the best, we are still using a simple digital camera, so photos are not as sharp as we want. We definitely need improved equipment for the future…. But our project is constantly advancing every month. So, what has happened the last weeks and what do we plan for the future? Birgit Schlick-Steiner, one of the editors of the Myrmecological News, published in Vienna (a propos, you should have a look!) visited us in our lab in Ulm. 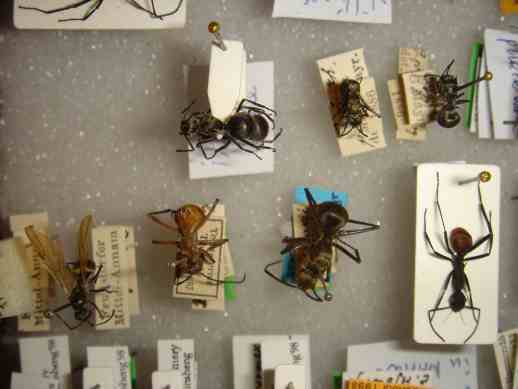 She brought along a box with more than 20 valuable ant species from the Natural History Museum of Vienna. Katrin has just finished the photographs, so now you can look at unseen specimens of this treasure of biodiversity, e.g. the paratype of Meranoplus borneensis that has been described by the late Stefan Schödl, the former curator of the Vienna Hymenoptera collection; or a specimen of Polyrhachis illaudata from Laos. In the future we are planning to ask more museums to unveil their secrets and make their collection available to you. Already we are getting more and more specimens from researchers, just recently a small parcel containing specimens of Cladomyrma ssp. collected by Joachim Moog from all over Malaysia has arrived. You will be able to see them in late summer. Next month, we will be visited by Donat Agosti, from www.antbase.org -the superb webpage on ant taxonomy by the American Museum of Natural History. We will try to get some information on his future plans about bringing more ant information to the web and if he agrees, we will present his interview in June! This may be the first step to report on ant researchers and their work…. However, we have a lot more plans. We are intending to establish a permanent poster presentation on Asian ant research. What to do with “old” posters after the congress is finished? Are they just a cheap and hidden decoration for the walls of your own lab? Antbase.de offers you the opportunity to present them to thousands of readers in the World Wide Web. You are encouraged to send them to us, we will present them soon as PDFs in the practicable Din A4 format. Yes, we are actively searching for collaboration! Perhaps you can provide photographs of your last collecting trip? Would you like to send us a report from the rain forest? Please do so, because we are planning to construct a network of ant researchers that share their experience. That’s our intention in AntBase.de: to communicate science. Sharing knowledge about a diverse species group among a diverse group of people….